We’d love your help. Let us know what’s wrong with this preview of A Date with Darcy by Tiffany Schmidt. Boys are so much better in books. At least according to Merrilee Campbell, fifteen, who thinks real-life chivalry is dead and there’d be nothing more romantic than having a guy woo her like the heroes in classic stories. Then she, her best friend, Eliza, and her younger sister, Rory, transfer to Reginald R. Hero Prep—where all the boys look like they've stepped off the pag Boys are so much better in books. At least according to Merrilee Campbell, fifteen, who thinks real-life chivalry is dead and there’d be nothing more romantic than having a guy woo her like the heroes in classic stories. Then she, her best friend, Eliza, and her younger sister, Rory, transfer to Reginald R. Hero Prep—where all the boys look like they've stepped off the pages of a romance novel. Merri can hardly walk across the quad without running into someone who reminds her of Romeo. To ask other readers questions about A Date with Darcy, please sign up. should i give it a try? i mostly read fantasy. i read the first 5 pages and oh boy, im annoyed. should i still read it tho? is it worth it? Tahlia Yes, it's so worth it! I love it soo much! Merrilee Campbell is the star of this young adult contemporary romance read in which this somewhat of a book nerd teen longs for romance like she's read in the classics. Merri is transferring to a new school with her best friend and younger sister and hopes that this year will be different for her. Starting our at Hero High Merri finds herself studying Romeo and Juliet in class and longing for her own Romeo when she meets Monroe Stratford. Not only is Monroe handsome but he quotes Shakespaere an Merrilee Campbell is the star of this young adult contemporary romance read in which this somewhat of a book nerd teen longs for romance like she's read in the classics. Merri is transferring to a new school with her best friend and younger sister and hopes that this year will be different for her. Starting our at Hero High Merri finds herself studying Romeo and Juliet in class and longing for her own Romeo when she meets Monroe Stratford. Not only is Monroe handsome but he quotes Shakespaere and goes for the grand gesture over and over again. At fifteen Merri thinks she's found her true Romeo but before long she begins to see that the boys in her books are much better than real life. Picking up this title I was under the impression it was a standalone young adult contemporary romance but since then the listing has been changed to show that this may be the first book in a series. The story is one that really was a bit over the top cutesy at times which made me think this one will probably be a favorite for the really young teens but a bit much for the older crowd. In the first half or so of this one Merri felt a bit too childish to me but as the story went on she did seem to get a bit better along the way. The story had it's funny moments but I do believe would have a much better shot at a wider audience had it been dialed back a tad bit. If it does become a series I'm not sure I would bother continuing on myself with the story. When Merilee transfers from an all girls school to Reginald R. Hero High she thinks it just might be the place she might meet her personal hero. That is, if they can live up to all the bookish boyfriends she's forever dreaming about. Having herself surrounded by actual Romeo's it seems that Merilee might just be living out one of her favorite love stories of all time. Okay, so I was really thrown by this book. Initially when I started this book I thought I would spend it rolling my eyes from cheesy cringe worthy moments. But I didn't! I must say, it did take me a quite a few chapters to find myself invested, but once I was, I was there for the long haul, which to be honest, I did think the book was a little long for a YA contemporary. So, at first I was a little confused, because I thought to myself, "where's Mr. Darcy?" because, to be honest, I picked this because I am a sucker for anything P&P inspired. When the book started off spouting Romeo & Juliet bits I was a bit lost. I am so glad I stuck it out, because somehow Schmidt was able to bring it around to relate to P&P. Let's just say I was swoony and cringing in the good way by the end, sighing, laying my kindle against my chest and smiling really cheesily towards my husband. If you want your HEA, it's definitely can be found here. I loved that this book referenced real books as well as I am assuming some fictional. A lot of the references were sneaked in so well, I just loved the extra seasoning it added to the book. I thought it really brought together the obsessive nature Merilee had towards books. The best part was how Merilee started to realize what a life would be like if the things that happened in the books happened in real life and ultimately how it made her feel. Okay, so things I didn't like? Obviously the slow to start and the length. I don't think I really need to delve more into that. The thing that really irked me was mostly how perfect everyone in Merilee's life was. I think too much time was spent on how swoony these boys were, especially when her best friend was incredibly sensitive to be objectified for her looks. I didn't think it quite matched. LGBTQ bonus, some of Merilee's new friends at Hero high were lesbian. The best part is, it's not pointed out as a struggle with their family or anything. It's accepted as a norm. Anyway, if you like cutesy YA contemporaries, especially ones that involve book nerds and psuedo retellings of classics, then by all means, pick this up. Oh and Tiffany Schmidt, please tell me that the next book is a Date with Theodore Laurence! Let's just talk about Merilee. She had a great arc as she learned from her selfish whims about dream boys to reality. Let me be incredibly frank about why I loved her from the beginning and please don't judge. I was exactly the same way when I was 15. I am not joking that I would rush into a "friendship" with a boy just to see if it would play out into a great swoon worthy romance. I'd like to admit that I was definitely boy crazy and incredibly flighty. I was Lydia Bennet. It's such a surprise that I got married at 18 and am still happily married 12 years later. Yay us. If ever I've related more to a character in a YA novel, that character would have to be Merrilee. Never have I laughed and smiled my way through a story so much, simply because I got it. I could feel it because in some ways, I've lived it, maybe not as an adult but definitely as a teenager. Merrilee is my book character soul mate. She understands it, romance, books, boys, and all. It's been a long time since I wanted to stay up into the wee hours of the morning reading a YA book but this book ch If ever I've related more to a character in a YA novel, that character would have to be Merrilee. Never have I laughed and smiled my way through a story so much, simply because I got it. I could feel it because in some ways, I've lived it, maybe not as an adult but definitely as a teenager. It's been a long time since I wanted to stay up into the wee hours of the morning reading a YA book but this book changed all that. It captivated me and lured me in like a roaring fire and a hot cup of cocoa on a dark and stormy night. Truly a fun and entertaining read suited for all ages and one I highly recommend. This was a very cute, light read! Although I did find it kind of boring at times, and the first half of the book definitely lacked the substance I was hoping for. I feel like in the beginning the protagonist lacked something and that made it hard to connect with her and the story. However the second half of the book took a turn and I very much loved it. Before requesting this title on NetGalley I was very intrigued because - A book about a girl who loves books? Sign me up for that anytime. So yo This was a very cute, light read! Although I did find it kind of boring at times, and the first half of the book definitely lacked the substance I was hoping for. I feel like in the beginning the protagonist lacked something and that made it hard to connect with her and the story. However the second half of the book took a turn and I very much loved it. Before requesting this title on NetGalley I was very intrigued because - A book about a girl who loves books? Sign me up for that anytime. So you could say I was very here for this. Merrilee is a bookworm and enjoys reading about bookish romances much more than the real life experiences. Obsessing over the boys she constantly reads about. Not believing that any relationship could be that great in real life. The book had a couple of strange, I'm going to call them 'magical moments' and I found that to be very interesting. It was almost like the books Merri read started to actually manifest in her life. I honestly found it a little weird to begin with and I think that was because the first one was Romeo and Juliet. The fact the protagonist wanted a Romeo and Juliet kind of love story made me cringe because I hate what that play represents and the references to the play almost made me give up reading early on. However I'm very glad I kept reading because all that was actually addressed and I am so thankful for that! If I was rating the book only on the first half I would not have given it more than one star but it totally got turned around and the author managed to surprise me. It was honestly, pretty excellent I'm not going to lie. There is a hint of insta love but I think it worked well with the storyline, at first the reader obviously isn't aware of the whole story so it's hard to push through if insta love is a deal breaker for you, but I would say if you do start reading and find it a little irritating like I did, to try and push through. In my opinion the story in its entirety was very well put together and I enjoyed the way the author took tropes that I usually hate and make me kind of love them. The second half was much more slow burn and there was tonnes more development and a generous size topping of angst. And you know me, I live for angst so I was definitely happy about that. The plot was slow to an extent but that wasn't a problem for me because I still flew through it, and in the places that it did pick up, it wasn't at all jarring and worked well with the storyline. The writing was very hard to get used to at the beginning, but I think my problem concerning that was that all my recent reads were very fast paced and there wasn't as many small moments dedicated to smaller things not just the main plot and it just took me a while to get used to that again. But I have to say that I very much enjoyed the slower pace. I adored the exploration of the sister relationships and the familial relationships in general. But my favourite thing without a doubt about the entire book was how strong willed the main character is. The instances that she stands up for herself are very empowering and it was great to see a woman take control and save herself, not get saved by a guy swooping in. I mean there are instances of that too but the parts where Merri sticks up for herself were fabulous! Overall this was a very conflicting read for me, because on one hand I really didn't like the first half of it while I was reading it but now looking back I understand it better after reading the whole thing, and I'm glad I suffered through those first few chapters because the end result made it worth reading. If you're looking for a light read with hidden depths to get lost in, I would definitely recommend giving this book a try. Keep an eye out for it on it's release date: 1st May 2018! Thank you to Amulet Paperbacks, Tiffany Schmidt and NetGalley for sending me an e-arc in exchange for an honest review! A book about bookish boyfriends that is called Bookish Boyfriends which will probably include a bookish boyfriend to add to an ever-growing list of my bookish boyfriends and that enables me to use the phrase 'Bookish Boyfriends' as often in one sentence as I just did and also has a reference to one of the most classic bookish boyfriends (Mr. Darcy) on the cover? And yes, it took me an absurd amount of time to figure out the logistics of that sentence. You're welcome. Oh. My. GOODNESS!! This book is perfection. I've been a big fan of Schmidt's work since SEND ME A SIGN, and this is Peak Schmidt. The main character, Merrilee, is short, bubbly, and with her nose always in a book, Merri believes in love, romance, and true love's kiss. Which isn't entirely her fault--her parents and older sister all fell in love with the first person they ever kissed, and Merri is looking forward her novel-worthy romance. But when she starts at a new school, Merri unexpectedly fi Oh. My. GOODNESS!! This book is perfection. I've been a big fan of Schmidt's work since SEND ME A SIGN, and this is Peak Schmidt. The main character, Merrilee, is short, bubbly, and with her nose always in a book, Merri believes in love, romance, and true love's kiss. Which isn't entirely her fault--her parents and older sister all fell in love with the first person they ever kissed, and Merri is looking forward her novel-worthy romance. But when she starts at a new school, Merri unexpectedly find her life mimicking the story of Romeo and Juliet--and she isn't entirely sure she likes where this is going. Two chapters in I was ready to give up on this book. I honestly didn't believe I could read a whole book from this protagonist's point of view. The voice felt forced. The writing was self-conscious. And I wasn't engaged. As I progressed the writing became less obvious and I ended up enjoying it. A Date with Darcy is essentially a retelling of Pride and Prejudice in an elite school setting. As such, it's pretty predictable. However, from the start I was hoping for a non-Darcy en Probably 3.5 stars. A Date with Darcy is essentially a retelling of Pride and Prejudice in an elite school setting. As such, it's pretty predictable. However, from the start I was hoping for a non-Darcy ending because the author gave us a likeable alternative who was established early in the book. Because of this I found myself a bit confused (not in a good way) about who the ultimate love interest was meant to be. An absolutely adorable read, following a girl named Merrilee who believes boys are better in books. Until those boys start showing up at school and maybe...aren't as great as she believes them to be. No need to know Austen to love this, though I suspect readers who are fans of Pride and Prejudice will pick up on some additional things. Pitch perfect for younger YA readers, too. This reminded me a bit of Avalon High by Meg Cabot, and I think there's a nice pairing to be had there. Thank you, Abrams Books, for allowing me to read this extraordinary book! It is a truth universally acknowledged that if you haven't read this book yet, you need to. When I say that this book blew me away, I am not lying. I adored Bookish Boyfriends. It plastered a stupid grin on my face for 99.9% of the story. I connected with this book and the characters on I voluntarily read and reviewed an advanced copy of this book. All thoughts and opinions are my own. Eliza, Merrilee's best friend, was extremely relatable, too. Her wit and knowledge and need to protect her friend was fun to read about. I'm really hoping that she ended up with... well, I won't spoil it, but let's just say someone sweet and kind, who may or may not have been trying to win her affection for the whole book. Fieldings—gorgeous, perfect, amazing, generous, uptight, unbelievably awkward, swoon-worthy. I honestly think I might be in love with him. Bookish Boyfriends gave me another book boyfriend. (How could it not with a title like that?) Fieldings's charm and obnoxiously perfect posture won me over from the start. I knew I would love him, even after many chapters with him acting like a total idiot. He has my heart. Besides these amazing characters listed above, I had many other favorites, too, such as: Rory, Lilly, Sera, Toby, Hannah, and Merri's other friends. They were precious. Also, little spoiler, I HATE MONROE. Okay, deep breaths. Let's move on. This book not only allowed me the experience to feel understood, in a way that only bookish people can, but it gave me hope. Boys in books have almost always seemed impossible, out-of-reach. But I know that's not true. There is someone out there, waiting to be my Darcy. Side-note: I really need to read Pride and Prejudice!! "Too bad book boyfriends gave paper cuts when you tried to snuggle. We have all been in this position where we fall in love and swoon over the dreamy man/woman in a book. You just imagine their arms wrapped around you on the toughest of days and they will make it all better. Sigh! This book is for all of us who ever had a crush on a book character and wasn't ashamed of it. I'm totally not ashamed to admit that I have may a few bookish men in my life that I wish was real. *cough* Prince Cardan *co "Too bad book boyfriends gave paper cuts when you tried to snuggle. I don't think I have ever had this much fun while reading a book. It took all the things we love about books and put it into another book. I'm still swooning! At first, I thought that the title was very misleading. I was reading and then I had to read some more just to make sure that my eyes weren't deceiving me. But we eventually get there and it's a huge sigh of relief. I'm not and never will be a fan of Shakespeare. There is nothing about his books that interest me. They are dull but Monroe has a way of changing your mind.... well just for this part of the story. The characters, the plot, the setting, everything about this had my heart screaming for more. It was adorkable. The twist, the turns, the ups, and the downs had me fascinated. The romance was a tad bit rocky but it never overpowered the story as a whole. I must admit Monroe was someone I should have despised, but he wound up being the rule breaker with those dangerous eyes that make us all swoon. He needs his own book! Book lovers will rejoice at the story that unfolds through these pages. Just try not to fall in too deep! As far as sixteen year-old Merrilee is concerned, boys in books are much better than boys in real life. What she wouldn't give to have a real boy sweep her off of her feet into a whirlwind romance like her favorite book boyfriends. She's about to get the chance of a lifetime when she, her best friend, and her sister start at a prestigious new high school, but things don't always turn out the same way for her as they do for her fav I received an ARC from NetGalley in exchange for an honest review. As far as sixteen year-old Merrilee is concerned, boys in books are much better than boys in real life. What she wouldn't give to have a real boy sweep her off of her feet into a whirlwind romance like her favorite book boyfriends. She's about to get the chance of a lifetime when she, her best friend, and her sister start at a prestigious new high school, but things don't always turn out the same way for her as they do for her favorite heroines. 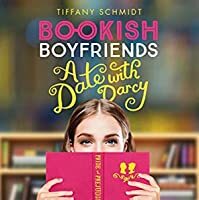 Bookish Boyfriends by Tiffany Schmidt sounded like it could be a fun YA contemporary. I have a hard time saying no to a character who loves books. Unfortunately, the first half or so of this story was incredibly grating, and a lot of that is due to Merrilee herself. As a book lover, I really hope I'm not half as annoying as Merrilee to my peers who don't love reading quite so much as I do. I probably gave my eyes quite a work out with all of the rolling they were doing in the sockets, especially as her English class starts studying Romeo & Juliet and Merrilee begins to think she's found her own personal Romeo - not what I'd call a good thing, by the way. The second half of this story is where things really begin to take off. I'd give the second half maybe four stars actually. I loved Merrilee's wake up call. She begins to grow as a character which was great, and a relief to see actually. By the way, I have to say I think I identified the most with Merrilee's English teacher - and that makes me feel pretty dang old. Finally, I liked the element of the events of the books Merrilee's reading seemingly manifesting into her life, but this totally wasn't that kind at all even though I wish it could have been. AHHHHH!!!!!!!!! This was so funny and cute. I definitely need more books like this. It was so sweet and I just wanted to die from cuteness overload through most of it. LOVED the Shakespeare references but ultimately didn't connect. Who wouldn’t want a date with Darcy? 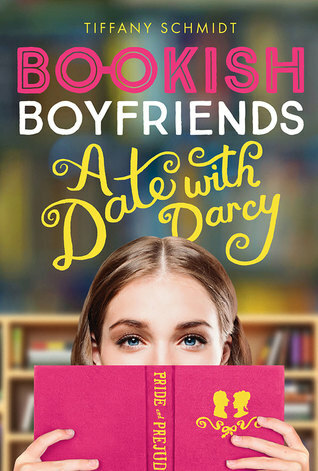 I don’t know… I was never Darcy’s kind of girl (I think Adrian Ivashkov would suit me better) but I’d still want to go on a date with Darcy, just like probably every bookish girl in this world would. Yet, our main protagonist Marrilee had a chance to really live that dream (and thank God she’s just a fictional character, because so many of us would be jealous of her!). From what I understood, A Date with Darcy came to life in the most amazing way. 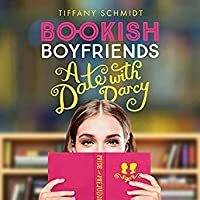 Tiffany Schmid Who wouldn’t want a date with Darcy? Tiffany Schmidt decided to write it when she realized there was no book about everyday girls dating real fictional characters. She wanted to read that kind of book, so she wrote it. I bet she had some fun on the way, because I surely had some fun reading the story she created. A Date with Darcy follows Merrilee Campel, 15 years old girl, who starts new school along with her sister and best friend. She immediately notices how polite guys in this school are and suddenly she gets a feeling they could be real book characters in disguise, with all the Shakespeare quotes and elegant attitude. Reading this novel was really fun, as it was pretty funny at times. I think younger audience would appreciate it more, but I think everyone who wants some amusement in the book would value it as well. The first half of the book was not the greatest. It was pretty childish at times and even silly, but the second half made up for all of it. Novel is written in first person, from Merrilee’s POV, and it reads on an average pace. It took me a week to finish this book, but let me stress out, it was a busy week. Overall, A Date with Darcy was an enjoyable read that I would recommend to younger readers. Okay. I was immediately attracted to Bookish Boyfriends. The premise just sounded way too cute, and I knew that if it was half as adorable as it sounded, I'd be on board. I had NO IDEA how much I would love this book. The writing is so. effing. cute. Fun, hilarious, intelligent. The word that comes immediately to mind is effortless. The tone is so lighthearted that I flew through the pages easily and readily. At no point did it slow down or become less interesting for me. The characters are just c Okay. I was immediately attracted to Bookish Boyfriends. The premise just sounded way too cute, and I knew that if it was half as adorable as it sounded, I'd be on board. I had NO IDEA how much I would love this book. The characters are just completely phenomenal. Two pages in, I made a note about how much I adore the relationship between Merrilee, our narrator, and her best friend Eliza. I LOVE girl friendships. Love them. The good, the bad, the in between. I want them all. This one is possibly one of my favorite friendships in all of YA. I could write an essay about how much I love Merrilee, our narrator, who is fifteen and boy crazy. What is refreshing is that she's boy crazy for boys in books, hence bookish boyfriends. She is SO quirky (describing her style as "toddler-chic" is something I love), SO silly. But also brilliant and unapologetically herself. We could all stand to be more like Merrilee. I'd like more girls to be comfortable with being both math geniuses and romance junkies. Her loyalty and friendship to Eliza is admirable and gorgeous and something all people should aspire to. We have Eliza, a gorgeous girl obsessed with biology who is an excellent friend to Merrilee, even if she doesn't get the romance thing. And a whole slew of side characters all distinct and beautiful. I won't even get into the leading men, except to say that I love them, also. I'm also OBSESSED with Merrilee's English teacher, though this is an area where I'm extremely biased. This book has SO MUCH TO SAY ABOUT WOMEN. It is subtle; feminist undertones are there, constantly, but it isn’t enough to be off-putting to those less inclined to our ways. I LOVE loud, bold, in-your-face feminism but I also love that I'm seeing a lot of this, like, thinly veiled girl power in YA. I love that the female characters in this book give you a ton to think about. We tend to think of girls (and ultimately women) as one thing. People are told to forget how multi-faceted teenage girls can be, and I think Bookish Boyfriends is a great example of their complexity. I LOVE books like this where the tone is just so fun and lighthearted. No apocalyptic stakes, no end of the world around the corner. A girl and her life and her friends and her first experiences with dating. I think this is great for people who like the softer side of YA. No cursing, no partying, no drugs or drinking. The kids are 15, so I think this is super fitting. All in all this is just a great, quick read and I can't wait for the next book! This was just such a relatable cute fluffy contemporary that was so amazing to read. I was highly anticipating this book and now I've read it, I'm so happy it didn't fall flat. This book was good! It had really good writing, a decently developed plot and some fascinating notions towards the importance of books and what they can give an individual, and how sometimes life can be just like a book (or not)! The only issue I had with this book was that it just didn’t gel with me for some reason. I can’t explain why - it just didn’t sit well with me. I didn’t really feel like I knew the characters or could relate to them in any way, and I didn’t find the story gripping enoug This book was good! It had really good writing, a decently developed plot and some fascinating notions towards the importance of books and what they can give an individual, and how sometimes life can be just like a book (or not)! The only issue I had with this book was that it just didn’t gel with me for some reason. I can’t explain why - it just didn’t sit well with me. I didn’t really feel like I knew the characters or could relate to them in any way, and I didn’t find the story gripping enough to compel me to thoroughly devour it like the synopsis made me think I would. I truthfully think this is a case of “it’s not you, it’s me”, with this book. I loved the writing, I loved the plot, the characters were decent... there was just something that didn’t click with me, and I think that’s okay. Books are supposed to click with us. Man, I was so excited for this novel! I mean who can go wrong with a title like that. Well it did go wrong in a few ways unfortunately. I thought it was cute and fun even though it was a bit slow and it just ended all messy and I can't even describe my feels for this book besides being torn! I received this book for free via NetGalley in exchange for a review. I actually really enjoyed this book! I picked it up at first because, come on, how many times had I thought boys are better in books? I just owed it to myself. Merrilee is such a fun main character. She’s daydreamy and wacky and awkward and to be honest, a complete mess. But I loved her. She was me, in a weird way, and I loved watching her be headstrong. Her best friend, Eliza, was equally great, although basically her complet I received this book for free via NetGalley in exchange for a review. Her best friend, Eliza, was equally great, although basically her completely opposite. While Merrilee was imagination and dreams, Eliza was strictly science. But she is fiercely protective of Merri and loyal to her so you can’t help but like her. Toby is Merri’s other best friend, and the classic boy next store. Sweet, silly, understanding. I’ll talk more about him later on. Merri also has two great sisters, and older one Lilly and a younger one Rory. She and Lilly have always been close, but she and Rory have more of a rocky sibling relationship. In a way, it reminded me of my relationship with my sister. They have the sweet sister moments, though, because you can see how the two of them care for each other even though they fight. Romance wise was where this went a little rocky. It’s basically modeled on Romeo and Juliet and Pride and Prejudice. We get two males in this, and one is the Romeo and one is the Darcy. Romeo (Monroe) is showy and flashy but as Merri recognizes doesn’t let her be herself. I was NOT a fan of their relationship, even in the beginning. Darcy (Fielding) start off basically hating each other, but then they don’t. The only thing I disliked here was it seemed very insta love. One second they’re fighting and the next Fielding is standing at Merri’s locker and proclaiming his like to her??? And I’m sorry, but I’m so rooting for Toby still. I love the Boy Next Door trope. As great as Fielding is. But I have an inkling that Toby and Rory will be a thing, since while Merri’s book was Pride and Prejudice, Rory’s is Little Women. And we all know what happened with that. That was adorable and loads of fun! Merrilee’s enthusiasm for all things books, boys, and swoon-worthy romance was palpable. (And completely relatable.) Do your-bookish-self a favor and read it. I wanted to like this book so BADLY! Unfortunately most things about it annoyed me and made me roll my eyes so hard that I almost saw my brain. 1. Names. Merilee, Monroe, FIELDING. Bc YA apparently. 2. The main character is so slappable it's not funny anymore. She's supposed to be super smart with IQ so high it would kill her if she jumped off it and yet she makes the stupidest decissions, misinterpretes what people do/say and then fixated on it, she's boy-obsessed ans she falls in looooooove on h I wanted to like this book so BADLY! Unfortunately most things about it annoyed me and made me roll my eyes so hard that I almost saw my brain. 2. The main character is so slappable it's not funny anymore. She's supposed to be super smart with IQ so high it would kill her if she jumped off it and yet she makes the stupidest decissions, misinterpretes what people do/say and then fixated on it, she's boy-obsessed ans she falls in looooooove on her first day of school.. because YA. 3. Monroe is such a villanous villain that the only thing he lacks is a mustache that he would curl while creeping through the night laughing maniacally. 4. People becoming friends in like 5 seconds. 5. Merrilee is new at her school and after like a week of it every teacher there is gushing about how good and smart student she is. Let's be honest, nothing happens during the forst and he last week of school, so unless Merrilee exceeded in reading syllabi then I don't believe that for a second. I think every reader has had a crush with a literary character, and our MC from this one is no exception. Now imagine those crushes and stories came to life and made you the protagonist, dream come true right? I loved: the entertainment level, the funny bits, the book references and bookworm identification, the characters and the pace. This was so cute, I feel I would have loved it when I was 16 years-old. As much as it entertained me and made me swoon at times, some bits felt too forced. The para I think every reader has had a crush with a literary character, and our MC from this one is no exception. Now imagine those crushes and stories came to life and made you the protagonist, dream come true right? This was so cute, I feel I would have loved it when I was 16 years-old. As much as it entertained me and made me swoon at times, some bits felt too forced. The parallels between stories are too similar, so much, nothing feels unexpected (unless you haven't read the books referenced in here). The author manages to creatively adapt classics into our current time. However, in some parts, the dialogue is too similar to the orginial work so it tends to feel a bit unoriginal in that aspect. This was so cheesy and cutesy. I did like a lot of the literary references and what not but overall it was just way over the top. It was the last day of summer when I finished this book. According to my mom, I was supposed to sleep early and get up early the next day. But at that time, I was 65% done with this book which meant I could finish it that night. Staying up until midnight just to finish a book is no surprising for us, readers. Yes, I didn't even feel sleepy the next day. You know why? This book was worth it! This book is about a girl, Merilee Campbell, who was a big reader (Yes! I know! Just like us!) She would ju It was the last day of summer when I finished this book. According to my mom, I was supposed to sleep early and get up early the next day. But at that time, I was 65% done with this book which meant I could finish it that night. Staying up until midnight just to finish a book is no surprising for us, readers. Yes, I didn't even feel sleepy the next day. You know why? This book was worth it! This book is about a girl, Merilee Campbell, who was a big reader (Yes! I know! Just like us!) She would just read everything she sees and yes, she lives in an world full of fictional characters from her imaginations. Actually, this was the reason why I chose to read this book. I can relate to her very well, right? The writing of this book is so natural that I'm so sure every teenager would be ok to read this book and can relate to some of the stuffs so well. This is definitely a YA and contemporary book. Merilee read a lot that she didn't even seem to notice that boys exist in real life. She would read a book, fall in love with a guy from it and tell her best friend, Eliza everything. Eliza read too but she was more of a Science girl. She would not believe in art of love or anything, but I'm sure she would believe the science of love tho. But she was the kind of best friend who never hesitates to listen to what her best friend says. I love her for that. The story started when she, Eliza and her sister, Rory moved to Hero High, a popular private High School in their neighborhood. They were sophomores. Rory was a year or so younger. Their English teacher that year was Mrs. Gregorie. And they had to study the play Romeo & Juliet! Later, she found out that the story that really suits her life was Pride and Prejudice by Jane Austen. She met a guy who was just like Mr. Darcy from that book. Fielding Williams, the headmaster's son. There. Read it and see what happens! Way more romantic, because his gesture was for her, not for show. "Eliza, I was wrong... While I'm definitely a Darcy fangirl-Team Fitzzy, Lizzwilliams? forever- boys are much, much better in real life." Going into this book, I was hoping for a cute and fluffy contemporary novel, and that is exactly what I got! This book was as sweet as cotton candy, which was adorable and fun. At first, I did have a hard time getting into this book because it was a bit slow and the characters felt SO young. I didn't care that the characters were younger than me, but this was a YA book where I could really feel how young the characters were. The dialogue in this book just had a young and childlike vibe to it, wh Going into this book, I was hoping for a cute and fluffy contemporary novel, and that is exactly what I got! This book was as sweet as cotton candy, which was adorable and fun. At first, I did have a hard time getting into this book because it was a bit slow and the characters felt SO young. I didn't care that the characters were younger than me, but this was a YA book where I could really feel how young the characters were. The dialogue in this book just had a young and childlike vibe to it, which made it hard for me to connect to at times. I definitely would recommend this book to younger readers as they would probably relate to the characters more than I did. Even though the characters felt so much younger than me, I still really enjoyed them. Merilee was a book obsessed girl who fell in love with all the men in the books she read. Merilee was a girl who believed men in real life could not measure up to fictional men, and I have never agreed with a character more! I also loved how strong and determined Merilee was. She was never afraid to stand up for herself and take control of uncomfortable situations. I think she is a great role model for younger girls! I found the romances in this book to be charming and precious! There was what felt like a case of insta-love, but I felt like it worked pretty well for this endearing and cute novel. The romance seemed like it really fit with the vibe of this book, so the romance did not bother me like I thought it would. There were plenty of adorable and swoony moments that had me smiling ear to ear throughout the book. I was really happy that this book also focused on other relationships besides romantic ones. This book explored the relationships between sisters and families, which was a heart-warming element of the story. Overall, this was a quick and fun story. If you are a younger reader who wants a fun contemporary romance novel, then I would recommend checking this book out! Okay so my book club and I picked this book and I had originally been super excited for it because this is literally any romance reader's dream, but I'm not too sure how I'm feeling about it. It was good and cute - I don't know where I checked out though. Maybe I never checked into being completely invested? I don't know. You know those books where you're reading the story but if you were to be experiencing it all in real life, it'd feel as though you were glossy-eyed and dazed the entire time? N Okay so my book club and I picked this book and I had originally been super excited for it because this is literally any romance reader's dream, but I'm not too sure how I'm feeling about it. It was good and cute - I don't know where I checked out though. Maybe I never checked into being completely invested? I don't know. You know those books where you're reading the story but if you were to be experiencing it all in real life, it'd feel as though you were glossy-eyed and dazed the entire time? Not being completely aware of everything? That's how I felt. Merrilee was a hopeful romantic. She is what many of us romance readers are on a daily basis, but she has the privilege to see her love of books come to life and that was the part that excited me most. IMAGINE THAT. Your favourite book boyfriend coming to life outside of the pages? Unimaginable but probably the best dream you'd ever have. The writing in A Date With Darcy was pretty good, I was intrigued for the most part. My issue was that I just didn't care for many of the characters - if any at all. Merrilee was the closest I came to connecting with one of them but there was no real substance to a relationship between me and this character outside of the fact that I would've LOVED to have the chance to meet a book boyfriend. And the fact that she was obsessed with books and reading. My issue with her was that she just felt too teen-y for me. I'm twenty-three, I realize that a twenty-three-year-old would probably have a difficult time finding a connection with a sixteen-year-old but I've been reading teen for years and rarely find this to be an issue. It wasn't UNBEARABLE reading through a sixteen-year-old's POV, it just wasn't completely tolerable either. You can find out more about her and her books at: TiffanySchmidt.com, TiffanySchmidtWrites.Tumblr.com or by following her on Twitter @Tif Tiffany Schmidt is the author of Send Me a Sign, Bright Before Sunrise, and Hold Me Like a Breath (Once Upon a Crime Family book 1).